« Keri, why are you drawn to unify Women’s empowerment, sisterhood re-wiring, singing songs, food as medicine, and the tenants of Nature? Humans are interwoven in the cycles of Nature. Whether we are awake and attentive to the apple’s bud break or maintain a steady autopilot in the incoming grind of tasks we encounter each day, humans have evolved in direct relationship to Nature and carry this inherent belonging in our DNA and subconscious. We eat daily (often a few times a day), clothe and shelter our kin, taking advantage of natural forces breathing sunlight into matter. We are intrinsically and interdependently linked to the green world however chaotic and busied our human-created modern world increasingly hums. Permaculture is an ethical design science inspired by Nature. Its observation of the Earth’s many interlaced natural systems informs design and installation within the physical and social human-built environment, intentionally fostering efficiency and alignment. This integrated worldview promotes diversity and resilience of natural ecosystems for the mutual benefit of families, communities, and the environment. 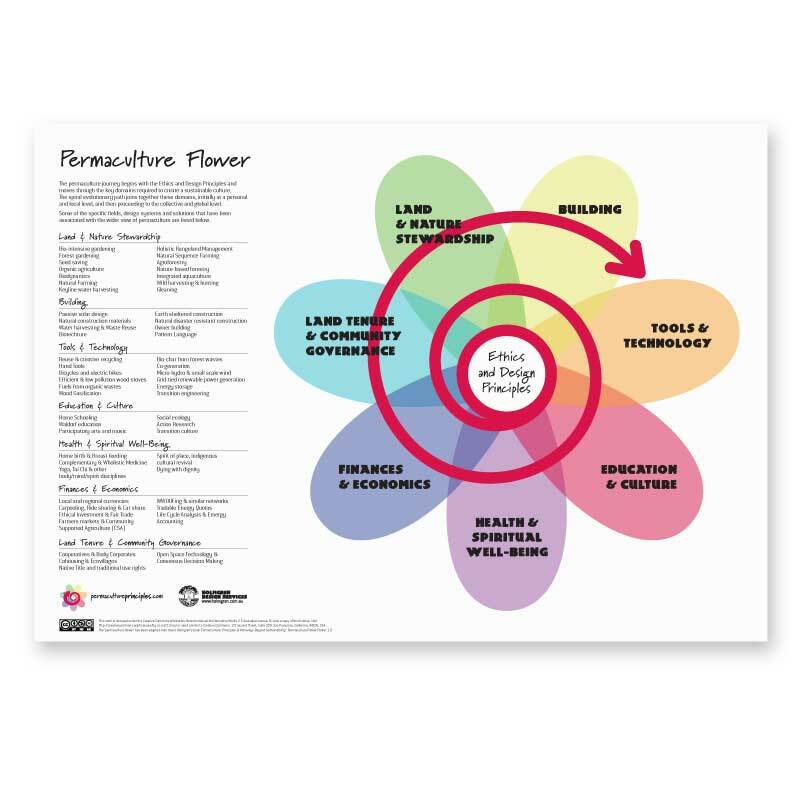 As a holistic design science, Permaculture covers all aspects of life from food production, land management strategies, animal management practices, renewable energy systems, and natural building to community revitalization projects, managing a business, and maintaining viable relationships. In natural systems, there is no waste as each resource feeds another. The dead branches, leaves and bird fertilizer nurture the forest floor, create habitat, and reduce evaporation and erosion. Nutrients cycle in steady relationship from intact biological worlds. In Permaculture, we identify and leverage biological assets around us to serve as food, medicine, animal habitat, biomass, and stored energy while our soils show increased fertility and ecological resilience in response to unpredictable climate factors facing future human and earthly generations. We receive and give back, closing the energy loop. Social, mental and emotional assets such as education, self-confidence, self-reliance, skill-building, and a deep sense of place impart comfort and safety from economic downturns and global crises. As with any fundamental change, deliberately moving away from an extractive relationship with the planet to one of mutual benefit and health requires’ new vocabulary, skills, time, and a deep commitment to the long view. Transforming a conventional high-input landscape into a biologically adaptive, resilient perennial food and medicinal system recycles resources and preserves personal and national economy over time. Healing Roots Design educate clients on the vital holistic connections and work in concert with natural systems that save time, money, and headaches, using Mother Nature as our guide. As the founder of Permaculture, Bill Mollison, states, “Permaculture is the art of not shitting where you sleep”. Principles: While there a few schools of thought, these are commonly held universal principles that apple to our personal, economic, social and political reorganization. These principles in use vary depending on application and situation.